The comfortable, reasonably priced rooms of this hotel, conveniently situated close to the motorway (A26) and town centre, welcomes you. The hotel's rooms are decorated in neutral colours and have simple furnishings. Free Wi-Fi access and a TV are provided. Food and drinks are available 24 hours a day in the cafeteria. A buffet breakfast is served every morning. From here you can easily explore Arques and the surrounding region. The hotel's reception is open from 06:30 to 12:00 and 17:00 to 21:00 during the week and from 07:30 to 12:00 and 17:00 to 21:00 during the weekends. However, when the reception desk is closed you can still check-in using the automatic reception machines, allowing you to arrive at whatever time you choose. 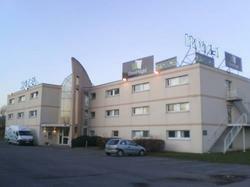 La Verreries Cristallerie, Arques (Crystal Glass Factory) (less than 1 km)- take a tour of the enormous factory. If you are feeling flush you can buy yourself a treat in the shop. Saint Omer (about 7 km) - see the town's beautiful cathedral, which dates from the 13th and 14th the centuries. - Take exit 4 for Thérouanne. - Follow signs to Arques on the D 77. - Take exit 3 for St Omer. - Take the N42 then follow directions to Arques-Lille on the ring road. - At the roundabout with the N 43 (Arques-Béthune), follow signs to Arques. Breakfast is served from 06:30 until 10:00 during the week and between 07:30 and 10:30 during the weekends . If you feel hungry at any time during the day or night you can visit the hotel's automatic cafeteria where you can buy a microwaved pizza or quiche and an array of drinks, cakes and sweets. Please note that breakfast ordered at the time of booking is non-refundable. This simply decorated room has free Wi-Fi, a TV and a private bathroom with a shower. This double room features a view, satellite TV and DVD player. This triple room features a DVD player.